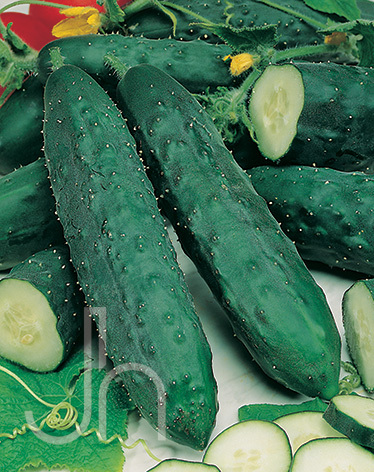 Poinsett Cucumbers are dark green and straight with small white spines which makes them perfect for slicing. They grow about 8 inches long with a diameter of 2.5 inches. Slicing cucumbers, or slicers for short, can be picked when they are 6-8″ long. Pick by turning cucumbers parallel to the vine and snapping off with a quick snap. This prevents vine damage. Days To Harvest: 75 days from seed. Outstanding Features: Cucumbers are very easy to grow. Poinsett Slicer Cucumbers are resistant to multiple diseases. Pick cucumbers when fairly young to avoid bitter skin. Although the cucumber has a higher water content than most vegetables, you can increase its nutritional value by serving the cucumber without peeling it first.